Is this some sort of Cramps swamp rock? A vampire echo Deadbolt? Down in the lab monster mash? No, I'll bet these three guys from Madrid just like getting drunk and dressing up like maniacs for their single covers. 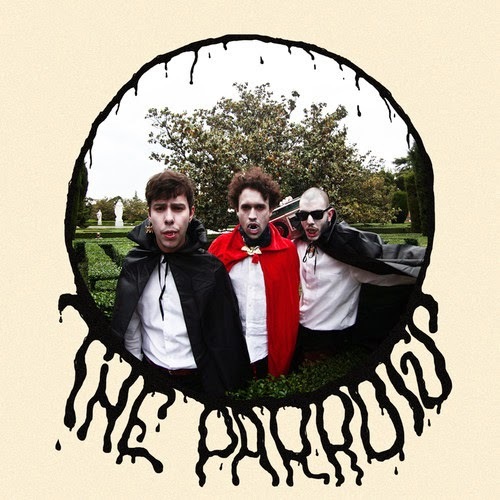 The Parrots are a raw, stripped down garage vocal harmony sound and attitude that's part Natural Child and part Hunx and the Punk. A-Side's "Loving You is Hard" has that swinging garage sound with all kinds of treble hiss. The reverb is huge on these vocals and snotty and like King Khan with a goofy weird attitude paying homage to the original sound and also prying it apart into sticky, sugary chunks. The background screaming acting like backup vocalists never did, kicking and screaming their way to the front. It's an optimistic party sound that should be played on the open deck of a cruise boat, drinks in hand and pattered shirts - or none at all. A regular jabbing beat, with those vocals buried in distortion and echo except 'oh baby' and 'Wooooooo!!!' The jangle expands in this middle section to add even looser, rawkus guitars with a slow picking strum that leaves you thinking, man that was a long minute and a half. B-Side's "I Am A Man" opens with a bass line lead in that huge 13th floor elevator reverb echo from "You're gonna miss me". Diego on vocals has more distortion all over this lead and those guitars are heavy in the back working on the lower end competing with the frantic vocals trying to get each other more wound up. Who's going to be the center of this track? Take your pick, they switch off with insanity. A brief pause toning things down to a warm slow warble this rest isn't nearly enough. Really intense and wild, a sort of unhinged sound like Screaming Jay Hawkins, and all those bending blues sounds that made some kind of deal with the supernatural. Get this from Bachelor Records - import only or check your usual distro's. These guys also carry a Mess Folk full length I've never seen anywhere...worth the airmail.